FIGURE 4-11 Mechanism of secretion of posterior pituitary hormones. 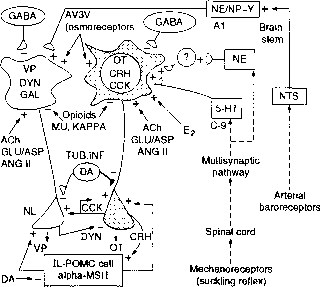 (A) Scheme showing the exo-cytosis-vesiculation sequence operating in neurohypophyseal terminals. Contents of the neurosecretory granules (nsg) are emptied into the extracellular space by exocytosis (exo). 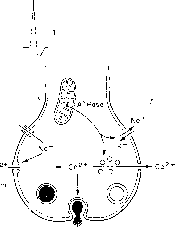 The granule membrane is reused from the surface of the nerve ending by vesiculation to produce coated caveolae (cc), which pinch off as coated microvesicles (cmv) and then shed coat fragments (cf) to become partially coated microvesicles (pemv) and then smooth (synaptic) microvesicles (smv). These are subsequently incorporated into lysosomal bodies (lyso). Reproduced from Douglas, W. W. (1974). Mechanism of release of neurohypophysial hormones: Stimulus-secretion coupling. In "Handbook of Physiology" (R. O. Greep, E. B. Astwood, E. Knobil, W. H. Sawyer, and S. R. Geiger, eds. ), Sect. 7, Vol. IV, Part 1, pp. 191-224. American Physiological Society, Washington, DC. 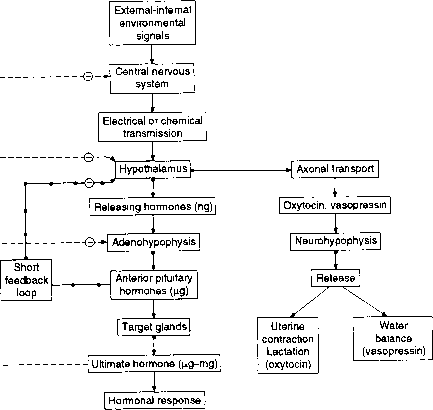 (B) Selectivity of secreted posterior pituitary hormones during exocytosis. The relative distribution of granules between axons, Herring bodies (nonterminal dilatations), and terminal dilatations has been measured by electron microscopy. The movement of granules has been determined by autoradiography. Readily releasable hormone may be about 10% of the gland content. Newly synthesized hormone is released preferentially, suggesting that new neurosecretory granules must first pass through terminals before moving on to less available storage sites. Reproduced from Lincoln, D. W. (1984). The posterior pituitary. In "Reproduction in Mammals; Book III: Hormonal Control of Reproduction" (C. R. Austin and R. V. Short, eds. ), 2nd ed., pp. 21-50. Cambridge Univ. Press, London and New York. 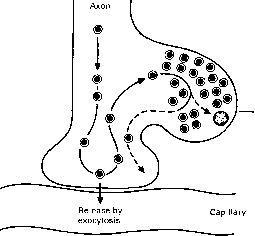 (C) Stages in the process of stimulus-secretion coupling within an axon terminal of the posterior pituitary. Reproduced from Lincoln, D. W. (1984). The posterior pituitary. In "Reproduction in Mammals; Book III: Hormonal Control of Reproduction" (C. R. Austin and R. V. Short, eds. ), 2nd ed., pp. 21-50. Cambridge Univ. Press, London and New York. (B and C) Reproduced by copyright permission of Cambridge University Press. FIGURE 4-12 Schematic view of magnocellular oxytocin (OT) and vasopressin (VP) neurons and the postulated neurochemical influences from local interneurons and distant reflex pathways found in vivo that theoretically can influence their gene expression. Arrows and nerve endings end in + or — symbols, which represent excitatory or inhibitory influences, respectively. Coexistent peptides, dynor-phin (DYN) and galanin (GAL), are shown in the VP cells, and corticotrophin-releasing hormone (CRH) and cholecystokinin are shown in the OT cells. Their complex interactions at the nerve terminal level in the neural lobe (NL) are also illustrated. Other abbreviations: PVN, paraventricular nucleus; SON, supraoptic nucleus; DA, dopamine; IL, intermediate lobe; POMC, proopiomelanocortin; ACh, acetylcholine; Glu/Asp, excitatory amino acids glutamate/ aspartate; ANGII, angiotensin II; NE, norepinephrine; NP-Y, neuropeptide Y; 5-HT, serotonin; NTS, nucleus tractus solitarius; Al, A2, and C-9, brainstem biogenic amine cell groups. Reproduced with permission from Gainer, H. and Wray, S. (1992). Ann. N.Y. Acad. Sci. 652, 14-28.
an increased rate. Presumably, specific phosphorylation results in increasing the transport of proteins called aquaporins (AQPs) that are sequestered in the cell at a constant level. Enhanced transport of AQPs to the apical membrane results in their insertion into the membrane and the creation of new water channels. An increased amount of water is absorbed into the cell by free diffusion and crosses the cell to the basolateral membrane, possibly enclosed in a particle that may be constructed of AQPs. Water is finally released at the basolateral membrane to augment the fluid of the blood, as shown in Figure 4-15. The net result is an increase in blood pressure and a lowered osmolality. These effects lead to a quenching of the signal to the vasopressinergic neuron (the osmoreceptor takes on water and resumes its unstimulated physical state). Increased serum tonic ity also signals the hypothalamic thirst center, which is closely associated with the osmoreceptor. Consequently, more water is consumed, which leads to the dilution of body fluids. Simultaneously, the kidney has sensed increased [Na+], which inhibits the Na+ conservation mechanism (Chapter 15) and results in the excretion of Na+, which in turn tends to reduce blood pressure. Thus, these two systems (and perhaps additional ones) function to maintain homeostatic water balance in the body. Water is transported in epithelial cells of two major classes. Some cells are highly permeable to water, whereas other types of epithelia, the so-called tight epithelia, are relatively impermeable to water. It appears that the latter class is under the control of VP, so that if these cells are not involved in water absorption normally under the influence of VP, there can be a significant stimulation of water uptake from the urine. In VP-stimulated cells, water appears to move through small aqueous pores across the apical (luminal surface) cell membrane. These pores appear to be formed in the cell membrane as a consequence of VP action. It is the apical surface in which the water pores are inserted under the influence of VP. This cell is also responsive to aldosterone, which stimulates sodium ion resorption (see Chapter 15). Water may be transported within vesicles (aquaporins) from the apical to the tissue side of the cell. Figure 4-14A exemplifies a vesicle capable of carrying water across the cell, which may be a member of the aquaporin family. This particular vesicle operates at the basolateral side of the cell, whereas the VP effect may occur at the apical side, where this type of vesicle (pore) may be formed to move large quantities of water across the cell. Figure 4-14B shows the structure of a single aquaporin molecule.